For hundreds of years the New Mexico Wedding Cookies have been used in weddings and quinceanera and other festive celebrations. The origin is primarily Spanish. Wedding cookies are connected with the tradition of saving rich and expensive food (the richest butter, finest sugar, choicest nuts) for special occasions. The New Mexico Wedding Cookies are a sugar cookie in the shape of a ball. 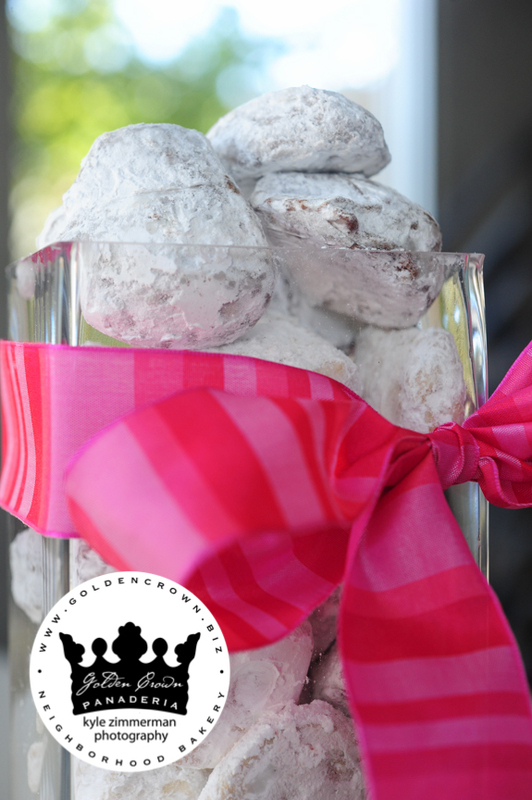 They have pecans in them and are rolled in powdered sugar showing purity and simplicity. The wedding Cookies are prepared for each of the tables by putting them in a net type of wrapping finished off with a bow. Usually each table gets about a dozen or alternatively each person gets about three or four. Each bundle is put into a glass cup like a martini glass. For over 30 years, we have been making the Biscochito by hand and continue a proud tradition. We are the first to make the New Mexico Wedding Cookies available in chocolate flavors.